So since retiring, I have done some work on the house. Then in 2016 I went to Ireland with a quilt tour group (Celtic Quilt Tours LLC) on my own (meaning no husband and I didn’t know anyone on this tour). Ireland was so well planned, that I signed up for their Scotland trip. The terrific people I met inspired me to travel again on my own. However, this time I decided to return to Dublin for two days after the Scotland trip. So off I went. First leg of the trip was LAX to Paris with 90 minutes to get connecting flight to Edinburgh. I took my little Alpaca bear along so he does show up in some pictures. The flight was on Air France and I have to admit that I was nervous at first. But that being said, Air France was terrific on both legs of the flight. Be forewarned that if the flight attendant is handing out a form, it doesn’t necessarily mean that they want you to sign up for a credit card. This was an entry card so the Customs person knows who is coming in. I had asked my travel agent (Pam at Open Gate Travel who is awesome) to set up a driver to pick me up. Two of the other travelers coming in from Canada were to meet me and we would share the ride in. Well British Air bumped them and then lost their luggage…. more later on that. The driver was terrific and gave me a running account of the buildings that we passed. He dropped me off at the hotel where after checking in, I went to the bar where our group usually congregates. We were all pretty excited to be back together. The hotel was near the train station and the Royal Mile. The next morning I met with the front desk person, Siohban, who was from Galway. She was so helpful telling me about the buildings across the rail tracks and how to get there. She is the kind of person you want to greet you at a registration desk. With my trusty map from the front desk, she gave me perfect directions on how to get over to the monuments. No rain but a little chilly. I visited the City Services building which, when built, was a jail. Also hiked up Calton Hill. There is a lovely monument to Admiral Nelson. The fee is 5 pounds to climb to the top. Worth every penny. Here are a few photos. Climbing up Nelson’s monument is over 180 steps but I made it. Magnificent view of the entire city. There are other areas up there. Some have not been finished. But it was a picture perfect day. Sun was shining and the breeze was great. Just the right temperature to get rid of the cobwebs from the previous day’s flight. A gentleman from Germany asked me if I would take his picture and he reciprocated by taking mine. The sign stated Calton Key which is kept in the building that was a jail and not City Services. There is also the Solider’s Monument which is over 275 steps which I thought I would do when our tour ended up back in Edinburgh. On the Royal Mile sits St Gile’s church. This is one beautiful piece of architecture and they ask for a 2 pound donation to take photos. As the sun came around and hit one of the stain glass windows, you could almost hear the angels go ‘Ta Da” so I paid the fee and got my sticker. The church is amazing and while I was in the gift shop, the mid afternoon service started. So I went back in and listened. Very inspirational, very moving and very touching. After hitting numerous stores, it was time for a little break. So the bear and I stopped for coffee. The odd thing was, you didn’t hear much of bagpipe music but more Motown. There are numerous hanging baskets with beautiful flowers on almost every building. So nice to see. Just ignore the grumpy looking guy. That is all for now which sums up about 1/2 my first day in Edinburgh. It is nice to explore on your own and it’s great to explore with friends. I hope that my blog can inspire you to take the leap and go on a trip by yourself. Well, it’s January which means time to get ready for Road to California Quilt show. This is more than a show – it’s more like an explosion of fabric, classes, vendors and amazing teachers. So if you are ever in the Ontario, CA area in January, please consider attending at least one day to view some terrific fabric art. This was a free project from Craftsy and designed by Kimberly Einmo who I met at Road and had as an instructor. The top is not quilted when I took this picture but my long armer did an exquisite job. Kimberly is one of the teachers that has also published books on Jelly Roll designs. For non-quilters, a jelly roll is anywhere from 20-40 fabrics all precision cut into 2 1/2″ strips. You can find her books at quilt stores or on Amazon. Spanish tiles is a pattern I bought at a Road show, bought the fusible interface that went with the design but then put it away. Pattern is by Marin and Colusa (always give credit to the designer) and the tile design is already on the fusible interface. Not sure why, but I put it away. Well, in cleaning out some items, I found the pattern. Then found the interfacing so that got me started. After a nice “cuppa tea”, I read through and found out that it wasn’t that hard after all. I tried a couple of squares with fabrics from my stash. I really liked it and decided to go on with the pattern. My lap size turned out to be 5′ X 5′ 1/2 ish. I also say “ish” as one side is usually just a tad longer or wider. To quilt this one, I will do hand quilting. It would a nice change of pace even though I do love standing at the long arm and getting the quilt done in an hour or two (depending on the size and pattern). Here is a picture of the completed quilt top that Elwood decided to check out. As usual, my quilts are CTCA, Cat Tested-Cat Approved. Again, this was done with stash fabric. 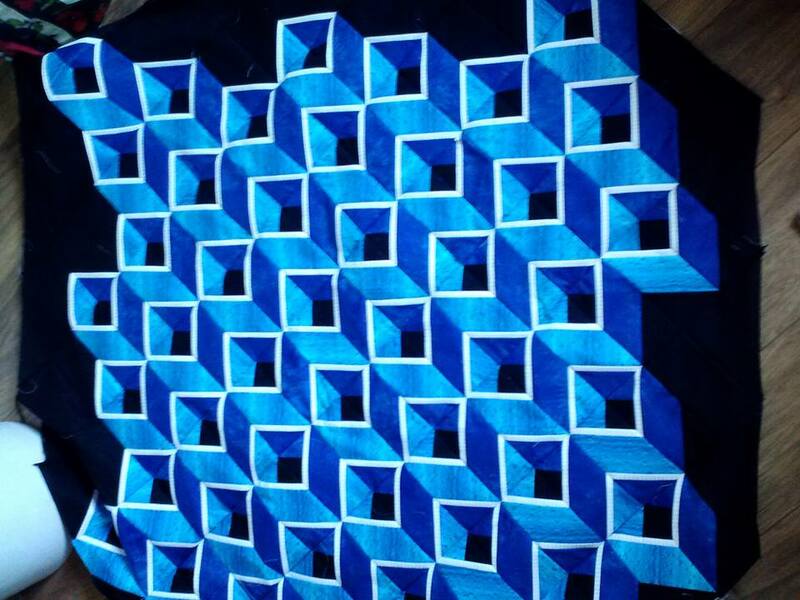 Quilting is my hobby, my passion and my stress reliever. However, when I want to rush through the pattern, that’s when little things will pop up – the tension gets askew, the thread breaks, one of my cats demands my attention, etc. Plus I usually like to sew when there is day light. However, since I wanted to get this top done to show at my guild meeting, I plowed through until 8 p.m. (Plus I wanted to watch NCIS). So I am excited about attending Road to California again. http://www.road2ca.com. New quilts to ogle, new tools, returning friends and new ones, returning vendors and so much more. There are also lectures scheduled, late night mystery classes and how to design your own patterns electronically. Thanks for reading. I appreciate your time. Have a terrific 2017! Well, I’ve been back from my first trip to Ireland and have gone through all the photos with relish (and a cup of tea). So many terrific memories and meeting great people. So here are a couple of my favorite areas. Now some people told me that you shouldn’t go to Belfast -too many fights, bombings, etc. Well, nothing could be further from the truth. Yes, they have had their differences. But the people have worked out some differences and the 30′ high gates are open. . Here is how one side decorated the fence. The gates/fence were all about 30′ tall. This was to keep the Molotov cocktails from being tossed. You could view this as graffiti or as artwork. They have the Black Cab tours which are conducted by the locals and give you a tour of the City. The City is continuing to work out differences and rebuild. We did tour the Titanic Museum which was sad but very informative. This photo was taken at Giant’s Causeway in Northern Ireland. (I’ve tried to get it posted the portrait way and not landscape but have failed) The landscape is truly amazing and that day we had terrific weather. The stones are not carved. The shape juts up and is amazing. You can get an audio tour which tells you the history and folklore of the area. I could have spent all day there hiking on the rocks and just breathing the ocean air. From there, we headed back towards Ireland. Each hotel was top rated, great staff, wonderful food and very accommodating. Now this tour was listed as a Quilt tour but we went to so many historic places, museums, famine ships and castles. One party was a Grandmother, Mother and 2 daughter group. Since one of the daughters didn’t quilt, she was able to do a horseback ride while we were at a famine/workhouse tour. So you can do other things as long as they fit into the time schedule. Just be upfront with your tour people and things can be arranged. My favorite city was Galway. It is so vibrant and filled with art and music. Again, friendly people, great food and the locals are wonderful. We went to the Aran Islands (Inishmore) and was able to climb to the top and look over the cliff. It was the perfect boat ride over and back. Again, great food, wonderful people and some great shops. I just followed the others and got on my hands and knees to creep up to the edge. However, I did creep to almost the edge for a photo. It’s a far drop below , and it is a stunning view. The photo below is the hike up to the former castle. We also visited Malahide Castle, Kylemore and the Rock of Cashel. Each one so full of great photos and history. So to keep my Irish feel going, I watch Quiet Man, Secret of Roan Inish, The Commitments, and listen to the Merry Ploughboy band (they have a great Pub in Dublin that is worth the visit). I also have a cuppa Irish Afternoon tea as well. I leave you with this photo of foxglove from the Kylemore Abbey. Ireland – you say it and tons of visions come to mind – green meadows, sheep grazing, nicely poured pint of Guinness, dancers, etc. I have wanted to visit this island for many decades and once retired, it was number 1 on my bucket list. I started researching tours as I didn’t want to drive myself. What better way than to be driven by someone, someone who knows the country, and someone who enjoys driving. In my quilt magazines there are always tours listed – from being driven to cruises. I Googled Quilt Tours Ireland and came up with a few names. There were two that caught my eye. I downloaded the itineraries for comparisons. Both were around the same price and length of visit. One guaranteed a small group – no more than 25 people. The other said no more than 50. So what do you do? You ask your guild if anyone had taken either tour. 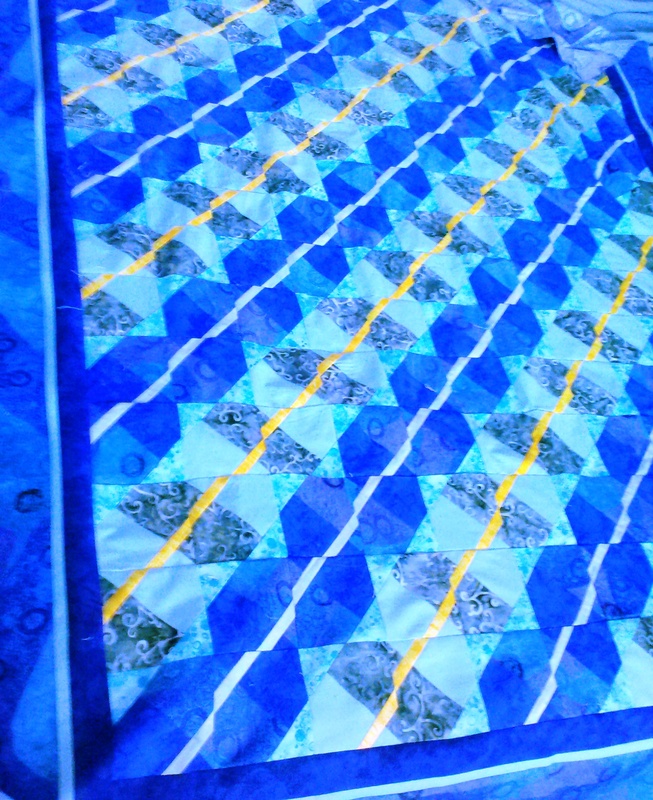 One guild member highly, and I mean, highly recommend Celtic Quilt Tours LLC. This tour started off with Dublin, up to Northern Ireland around the west coast and back to Dublin. The places listed were all around the coast of Ireland. I sent off an email explaining that this would be my first tour as well as my first trip overseas. The American contact was so helpful. For four months before the tour started, we received newsletters about the trip. Everything from where we were to meet at Dublin Airport, how much money to bring over in Euros and pounds, the Horizon VAT cards, shopping trips, packing items, size of luggage etc. Our first item was a tour of Dublin and then off to visit Malahide Castle. The tour provided breakfast as most of us came in on red-eye flights from the States and Canada. We could opt out for shopping or a tour of the castle. The gardens were beautiful and the castle tour guide was extremely informative. We went back to the hotel and checked in. Now by this time my eyes were rolling around in my head from being up so many hours. First thought was – I need a nap. But then my brain kicked in with “You are in Dublin – get out and explore”. Splash some water on my face, grab a glass of water, brush my teeth and off I went. Down Grafton Street, past Trinity College and in to a few stores. We had on our schedule to visit the Book of Kells the first day but due to other circumstances, it was held off. One thing about a tour is to be flexible. Dinner at O’Callahan’s was great. But by 9:30 pm, I was done. Plus we had to have our bags out in the hallway early the next morning for the porters as we were leaving Dublin by 8:30 am. Off to Belfast in Northern Ireland. The past problems have been resolved and restoration and revival has been started. This is a very passionate city. More later on my trip as this was a 13 day tour and I took a lot of photos and notes. But in a nutshell, great trip, great people on the tour, amazing tour driver, beautiful scenery, terrific people in every city and delicious food. More later……. Sometimes you receive news that just hits you in the gut. Well I had a wonderful co-worker tell me that not only had she gone through thyroid cancer, she was recently diagnosed with breast cancer. Knowing she loves Hawaii, I found the fabric and made this quilt. I say had as I have retired – not that she passed away. This quilt, which is lap size, could keep her warm while she was going through chemo treatments. As I was sewing it on my Bernina, quilting it on a long arm and then the binding, I would pray for her to have a complete healing. She is not a Christian but it made me calm. I tend to get very irritated when I hear of someone diagnosed with cancer. Now I live in Southern California so we don’t have much cold weather. But there are some nights that snuggling under a quilt just makes life so much better. The fabric was purchased from Beyond The Reef at the Road to California show. The fabulous staff assisted me with the colors for the Twists. Another former co-worker is going through PTSD. I never knew why she left the job but she did disclose later. Sometimes, especially when they live in another state, you get frustrated as you can’t reach out and give them a hug. So I quilt. The last quilt I did arrived at this person’s house just after she heard that her former supervisor/mentor had died suddenly. I got a picture of her under the quilt with her dog which made me very happy. This one is called fan dance. I am a fan of this person so it seemed to be the right quilt to send. So if you have a friend that is going through a rough time, consider a quilt. You can sew blocks together, stitch in the ditch to hold the batting to the top and then add some yarn in each block. Have friends tie a square knot while adding a prayer. Prayers can be silent, or the person can write it out and attach the card for the recipient. They will appreciate it. So keep quilting. It keeps your hands busy and your heart full. At least it does for me. Challenges come with many faces – it could be not biting someone’s head off on Facebook for skewed political statements, song lyrics, etc. I enjoy challenges – like doing the crossword puzzle with a pen, baking a new and somewhat complicated dessert or even trying to come up with a budget that works. In one of the AQS brochures, there was a picture of two quilts looked like it was more than straight seams. 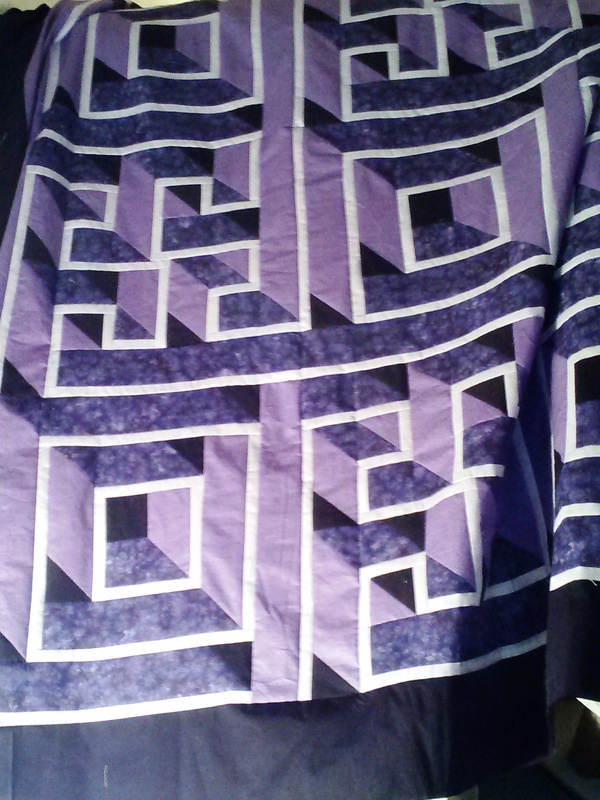 The quilts were designed by the Guilty Quilter in Portland Oregon. And it had my favorite saying on it “No Y seams”. 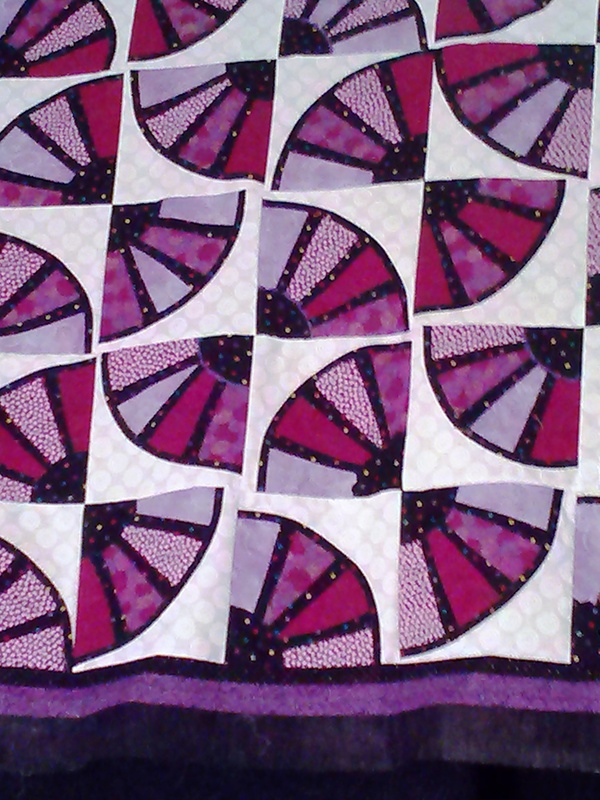 For non-quilters think of putting another fabric in a 45 or 60 degree angle. You stitch to 1/4″ from the edge, stop, pull the fabric out and start 1/4″ on the other side. If not done correctly, you can get a pucker or a wavey mess. The first one I did was Labyrinth. It is a wonderful 3-D effect, One thing I found challenging on this was you need to cut two angles – top right and bottom left. I should have quilted it first and then cut the corners off. The challenge was getting it placed on the long arm correctly. The first try at it was so off, I had to rip out 4 rows of stitching and start over. The next challenge from the same designer came out like this. Once you break down the pattern, relax a little, you realize “I CAN DO THIS!” So my goal was to get this top complete prior to my week up in Oregon. To quote Rebel Wilson’s character in Perfect Pitch “Crushed it”. As a child, I grew up in a beach community. It was great going to the beach after school, weekends and all summer. The change in the sea was always a swirl of teals, blues, turquoise, and greens. Even when the weather was overcast, the water and sand can make a person calm, happy and tranquil. Even the worst day at the beach was always better than the greatest day at the office or school. I saw this pattern and knew it was something I just had to make. This really was one of the easiest patterns to work. Couple of colors and voila, it’s done. All that is left is to get quilt time on a long arm and go! Now the beach isn’t for everyone – some people have fair skin, like myself, so an excellent sunscreen is needed along with a great floppy hat and protective clothing. And some locals have a hard time with visitors (really don’t like the term tourist). However, when visiting the beach, please be aware of what you arrive with and what you leave behind. Arrive with a pleasant attitude – be aware of your surroundings (like keeping the swearing/music at a minimum if there are kids nearby) – Watch the water as beach waves can sneak up on you – leave the beach clean. Remove your garbage, clean up after your dog if dogs are allowed on the beach. I have wanted to take a bag of sand home with me so I could dip my toes in it and just remember the calmness it brings me. But, with two cats it would be a temptation for them. And secondly, it would be removing something that belongs to all of us. Enjoy the beach! And now, upstairs to tackle a pattern and material that I purchased last year…..